When your turn begins, you may choose a server. The first time you make a successful run on that server this turn, instead of accessing cards, gain 2credit. She was as good as Mr. Li said. The source machine had been compromised in under 24 hours. 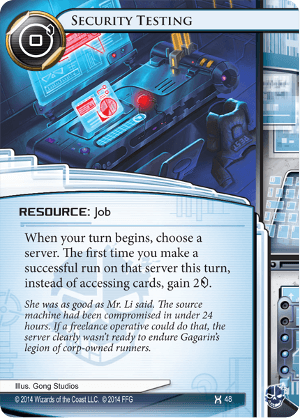 If a freelance operative could do that, the server clearly wasn't ready to endure Gagarin's legion of corp-owned runners. Two ways to look at this card: "MONEY! Woot!" and "Hey, Corp, waste money and clicks on Ice, ok?" As a reusable "2 for 1 " card, you can look at this as a way for getting a little extra money per click, once per turn. It works well with other "sucessful run" cards. Particularly if you have Desperado and a John Masanori installed and use a Dirty Laundry, this card can really punish a corp who doesn't want to Ice up remotes and archives. For Archives, Datasucker also adds to it, and if you know you will be running every turn you can even throw in a Grifter got more cash... but that might be taking it a little far. Even without the dirty laundry, in the "MONEY! Woot!" theory, this is a "1 click for 4 credits, a card, and a datasucker token or two." Click compression at it's finest. So the corp sees this and says, "I better put something over Archives, even if it's just a Pup or a Caduceus to cut that down to 2 credits, a card, and some tokens." That's one fewer ICE to protect somewhere else, 1 fewer card in HQ, and a 1-3 credits for the Rez. Against horizontal decks (except RP) that like to have 2 or 3 bare remotes, this can be a major pain. You don't want to ice up all of those assets, but gosh, if you don't this stupid runner just waltzes over me with amazing money and maybe even some card draw compressed into 1 click. Sounds good, right? So why isn't this the Jackson Howard of runners? Also dead draws. You can't use two of these to get 4 credits in one click by themselves. So unless you are running twice on two different servers, the second one is not all that helpful. And that brings up the set up time. Just this one card... run and don't access my stuff. Whatever... it's two credits. Until you start getting a few other cards, all you are doing is making sure my SEA Source will work when I draw it. So while you find John and Desppy and everything else, I'll just be over here scoring agendas... loser. And lastly Glaciers! When my corp idea is to set up huge servers with 3 or 4 ice each anyway (I'm looking at you RP, Torchwood, and Foundry) then let the runner put out cards that replace their expensive trip through my server with 2 creds... ha! The one true Criminal answer to asset spam, and one of the few Criminal H&P cards to withstand the test of time. It has a (literally) free install cost of 0, potential gain of 2 for a , not to mention synergy with other run cards. These days, Criminals are also packing Temüjin Contract and Tapwrm for a "successful run" economy powerhouse. Criminals have the least in-faction asset trashing and/or long term economy cards as compared to Anarchs and Shapers. This often means that they struggle to play the stamina game. Commonly rigged with Desperado, each SecTest is effectively ": 3" for every open server. While SecTest can still threaten Archives in the early game, naturally, it is not as effective against glacier. That is what cards like Los, FAO, and T-Contract are meant to deal with. Having a balanced deck is important so that you actually stand a chance when playing your weaker match-ups. Fast forward a few years, SecTest is still a core staple of (aggro) Criminal decks, as it forces the Corp to ICE every server, or risk giving the Runner a fortune.